Audio-Techinca is always known for their limited edition and subsequent update of old model. 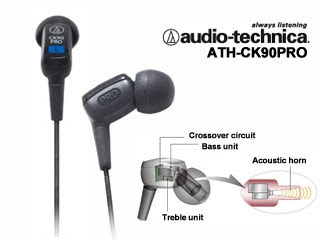 This week, they introduces to us a new dual drivers IEM, the ATH- CK90PRO. With the recent faint out of CK9 (AT first flagship balanced armature IEM) and the usage of 'PRO' naming scheme, this new IEM (along with its big bro the CK100) is undoubtedly set to replace the old CK9/10 series in due time. Beside a bit of unconventionally designed earpieces, the new IEM also features something you only find in the speaker world - an acoustic horn in the nozzle. Now horn is nothing new, but never did anyone think of shrinking it for IEM use. AT claims that the design helps to reduce energy loss as sound wave travel through the nozzle, thus resulting in better sound quality. Whether it is true or not remains to be heard, but the spirit of innovation should be commemorated: Well done, AT! MSRP is estimated at US$280 but as always, finding a place that sell it without charging outrageous shipping fee probably will be a challenge. Speaker Type: Dual Balanced Armature Drivers with Passive Crossover. Westone 1 announced, but no splash in the water.